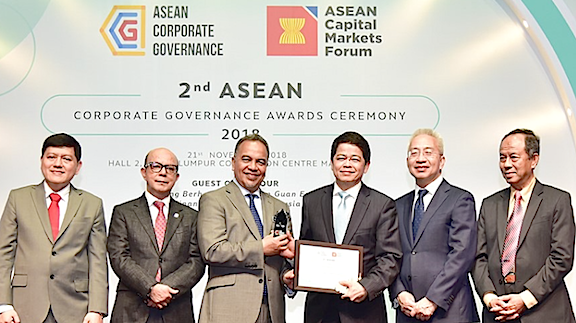 Thaicom Public Company Limited, led by Prasert Bunsumpun, Chairman of the Board of Directors, received the ASEAN Corporate Governance Awards for the Top 50 ASEAN publicly listed companies category for the second consecutive time. 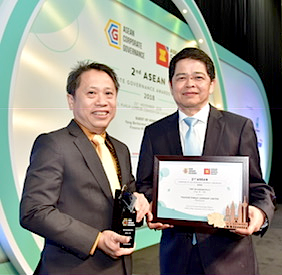 Kudos to Thaicom as Thaicom Public Company Limited, led by Prasert Bunsumpun, Chairman of the Board of Directors, received the ASEAN Corporate Governance Awards for the Top 50 ASEAN publicly listed companies category for the second consecutive time. The ASEAN CG Awards reflects Thaicom’s outstanding score in terms of corporate governance practices based on assessment using the ASEAN Corporate Governance Scorecard (ACGS). This ranking will help to elevate the level of corporate governance quality among Thai listed companies in ASEAN. The ASEAN Corporate Governance Awards is initiated by the ASEAN Capital Markets Forum (ACMF) with the support of the Asian Development Bank (ADB) to establish a common governance framework across the region and to raise the profile of ASEAN PLCs within the global investment community. The 2nd ASEAN CG Awards Ceremony was held on 21 November 2018 in Kuala Lumpur, Malaysia. The award also recognized Thaicom’s achievements toward sustainable development by adhering to corporate governance (CG) principles and raising the bar for CG practices that promote transparency and consistently create shared value for all stakeholders. Thaicom has been recognized by leading organizations in Thailand for its sustained good corporate governance, earning itself excellent governance ratings for last six consecutive years. The company has also been selected for the 2018 Thailand Sustainability Investment (THSI) list based on the Stock Exchange of Thailand’s (SET) annual sustainability assessment. Thaicom also received the certificate of full membership of Thailand’s private sector “Collective Action Coalition Against Corruption” (CAC) from the Thai Institute of Directors Association (IOD) for two consecutive years. The company has continuously raised the standard of good corporate governance, transparent disclosures to shareholders, and the equitable treatment of shareholders.